We help high-touch businesses achieve higher sales while improving the customer experience. Wynne Business spa management consulting specializes in working with Experiential Enterprises: consumer-facing service companies where stellar service is essential and where competition is fierce. Whether you’re a medical practice, an independent retailer, a restaurant, inn, spa, or salon, you want better sales, profitability, customer loyalty, and employee engagement. We’ll help you transform great customer experience into good business, with a strong focus on creating new revenue sources and growing existing ones. We help high-touch businesses achieve higher sales while improving the customer experience. Are you thinking about opening a new day spa? 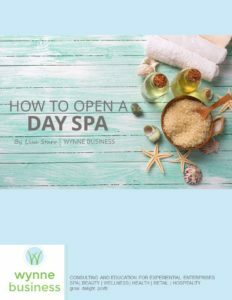 Get started in the right direction with our newest eBook: How To Open A Day Spa. Learn more and download your free copy here. To learn more about how we work and who we work with, contact us at consultants@wynnebusiness.com, or call us at 610-368-6660. We’d like to provide you with a complimentary 30-minute Needs Analysis.